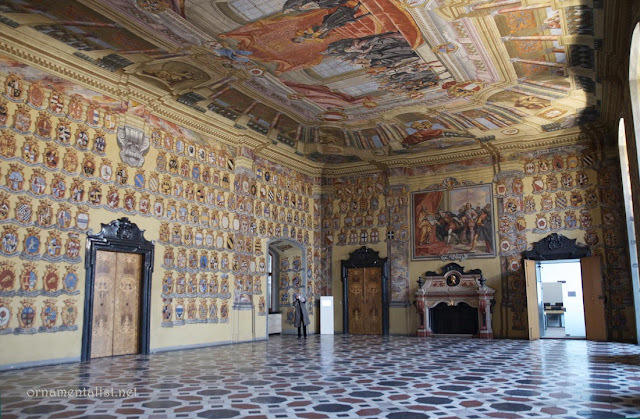 The capital of the Austrian state of Carinthia, Klagenfurt boasts a splendid Landhaus, or "country house," built as the seat of the state government in its more feudal arrangement, and which now serves as the state house as well as a museum. 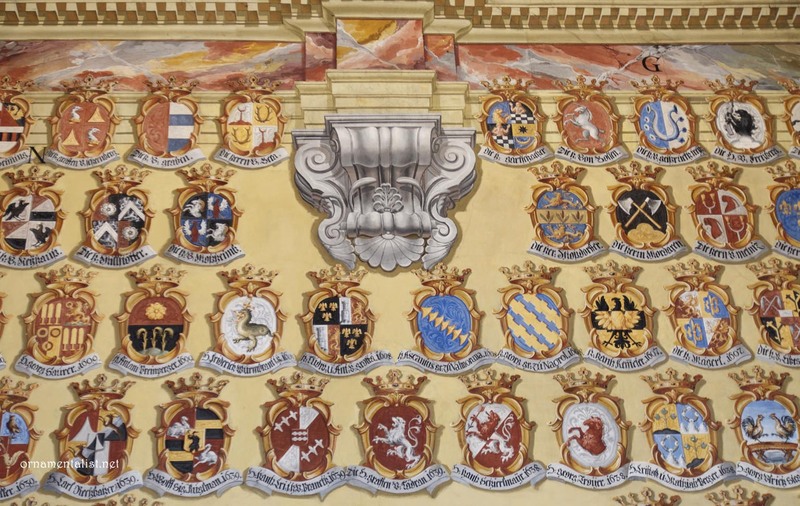 It's famous for its magnificent Wappensaal (Hall of Arms), a must-see for heraldry geeks and ornamentalists alike. The arms of the noble families of Carinthia painted on the walls of the Klagenfurt Landhaus Wappensaal. The Landhaus and the Wappensaal date from the early 16th century but suffered a great fire in 1723. The building was remodeled in the Baroque style and the Hall redecorated by painter Josef Ferdinand Fromiller (1693-1760). 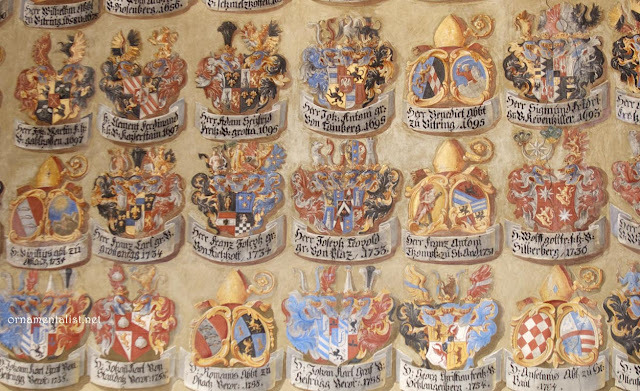 In addition to the grand Scheinarchitektur ceiling fresco and a pair of murals depicting important events in the founding of the Carinthian state, the walls are covered with over 650 coats of arms of all of the armigerous families of the region. Some additions were made in later years all the way through the 19th century, with a few spaces left blank to honor extinct families whose crests could no longer be found. 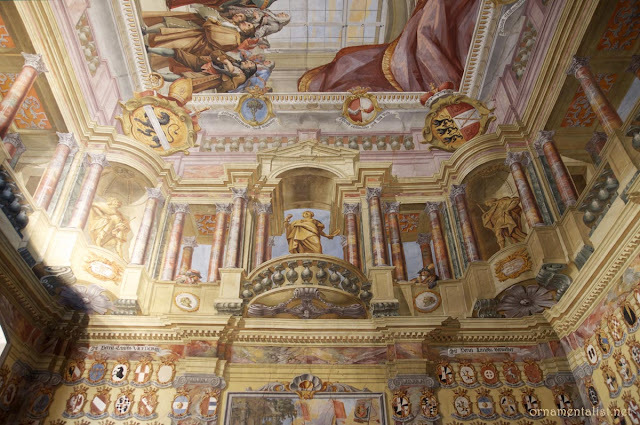 Josef Ferdinand Fromiller's ceiling fresco features a brilliant quadratura colonnade and portraits of himself and his sons in the corner. 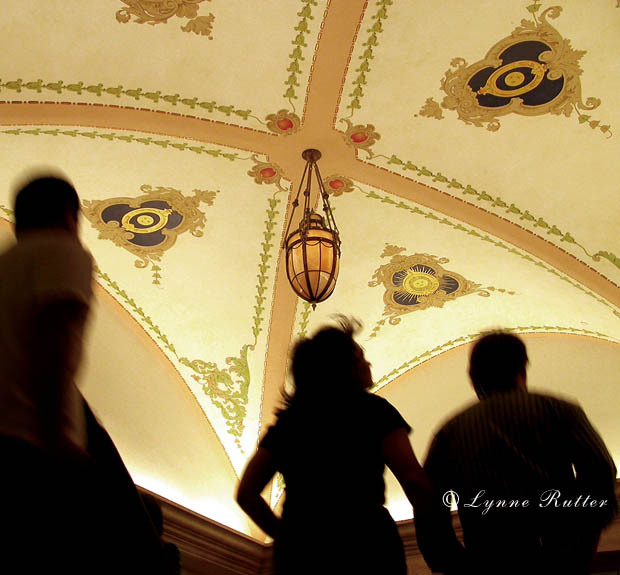 The trompe l'oeil in this grand hall is elegantly painted, and very effective. However the almost graphic pattern of arms emblazoning the walls is stunning both as decor and as a device for creating a sense of continuous history. Which is rather the point after all. 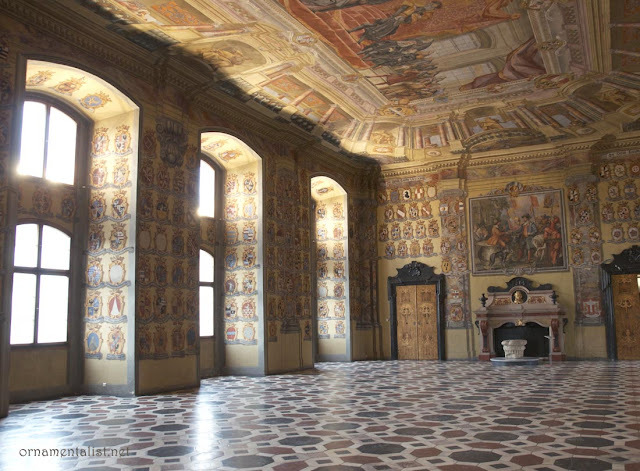 The inlaid marble floor and baroque marble doorways were created by a Venetian master named Francesco Robba. The marquetry doors are also particularly fine. After years of traveling together, Erling has now amassed a collection of photos of me taking photos. He is over there capturing me with his iPhone. Kleiner Wappensaal (1740), currently used as a conference room. 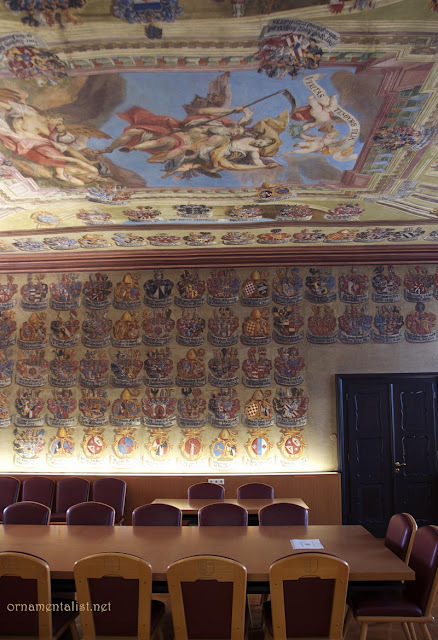 Is your conference room emblazoned with armorial splendor? No? Well maybe it should be. For German and Austrian arms there is of course a great book (just as there exists for English and French arms) identifying each family and you can find this Wappenbuch online. I am reining myself in tremendously here because I can go on and on about heraldry and other rooms decorated in this way, and am bursting to do so, but I am going to have to save that for another time. Stay tuned for more from Austria coming up soon! This is almost overwhelming....and I wasn't even there! It reminds me of the medical University of Bologna. 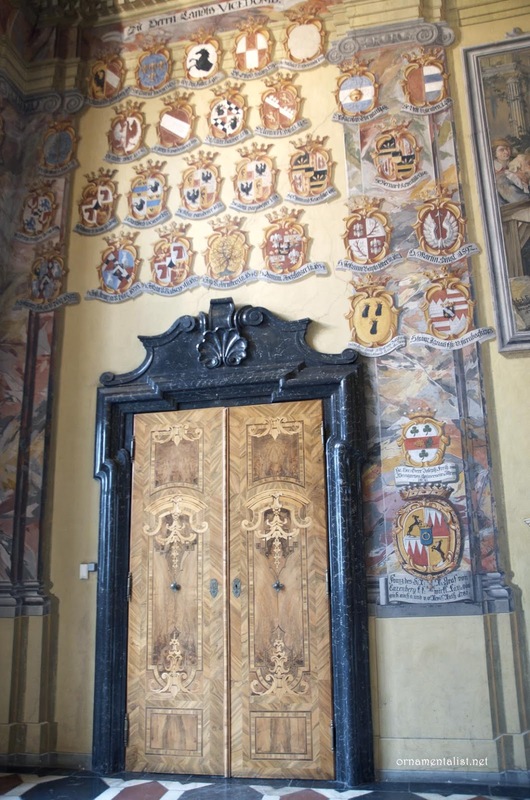 While those crests are almost edible, I am in awe over the marquetry doors...I am working up a design based on the Rubelli doors in Venice and these really attract me! Fantastic post...can't wait for more! Heraldry is a pretty cool field to specialize in. Lots of ornamental opportunities, and the design of these collections can be brilliant. Makes for some fabulous rooms! and yes the doors are fantastic- a bit more than just marquetry. Dear Lynne, Oh my. What fantatic source "Wappenrolle". Thank you Lynne. Unbelievably beautiful! I love coat of arms and have a passion for trompe l'oeil banners. Yeas ago I painted banners under seven trophy heads in a beautiful formal living room. To this day it remains one of my favorite things I've ever done. So fun and even though small made a huge impact on the room. I can only imagine the impact of standing in this lovely room with floor to ceiling coat of arms and banners must be. 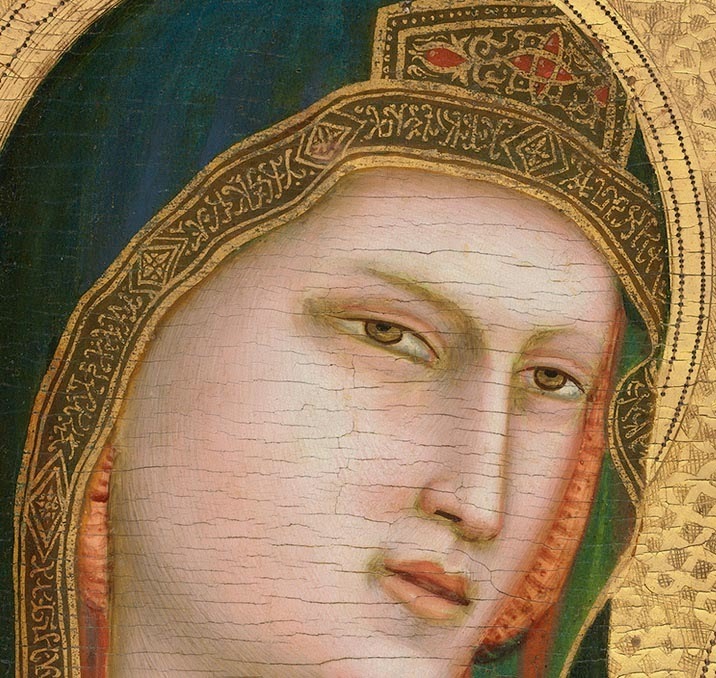 Thank you for such inspiring eye candy! would love to see that Tamra, is it on your website? Though I do have a coat of arms from my father's family, I am really motivated to design a new one for the Maestro and me. Lynne, Thanks for sharing this, I have family in Klagenfurt and never knew about this gem! I must go see it. Lynn, it will be later this week. Moved into a small studio so redoing the website which will be up by the end of this week. I've been reading more about this fabulous room since your post, it's so amazing!! So glad you got to see it in person and share it with us. Great photos. Your recent European trip looks to have been a blast. That ceiling looked so weird in the first photo, with the trompe l'oeil seen from an odd angle, but then I guess that's normal. The view looking up at it looks spectacular though. It's amazing how dependent trompe l'oeil is to a particular standpoint. Anyway, thank you for sharing the photos of your trip. True, Alan, the perspective only reads from one precise moment on the floor. Being in the right spot matters that much more with such a lofty design. I am hoping to sort through more photos soon. Been busy since I got back!